Matt Carthy, MEP, Sinn Fein. as a result of stealth charges and taxes. He predicted that the water charges in Ireland would be defeated. devastation and hardship to many families. “These taxes have not led to improved services; they have each been unfair and have targeted those on lower incomes disproportionately. “Well, now the Irish people have had enough. In their tens and hundreds of thousands, Irish communities have joined together and marched against the latest tax on their families. “The Irish government calls it a water charge – the Irish people see it for what it is – another tax that, if introduced, will put many people over the edge and will further hamper our domestic economies. “That, under pressure, the government has now introduced temporary caps prove that this charge has nothing to do with water conservation but is just another attack on Irish families’ incomes. 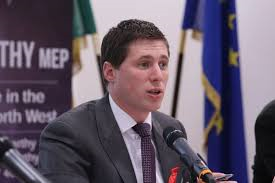 Speaking after the plenary speeches, Carthy said that he believes that the proposed water charges scheme is not in keeping with the provisions of the EU Water Framework Directive and that he is awaiting responses from the European Commission on the issue. “Article 9 of the European Water Framework Directive clearly states that any scheme for the recovery of water services costs must be based on the polluter pays principle and must contain an incentive for water conservation. “The model proposed by the Irish Government – which introduces universal caps and grants not linked to water usage – undermines the environmental and water conservation principles which underpin the Directive. Previous PostBold Thinking Needed if Western Rail Corridor to Succeed – Dooley.Next PostIF THE PURPLE FLAG SLIGO IS PURSUING IS NOT ABOUT PROMOTION OF ALCOHOL WHAT DOES IT STAND FOR?